The ADAM is available in two models, the complete system and Expansion Module #3. When the memory console of Expansion Module #3 is connected to the ColecoVision, the two models are essentially identical in function. The unit pictured here is the expasion module #3 (it is shorter than the complete unit). The expansion module #3 uses part of the Colecovision hardware, thus the memory unit doesn't have any cartridge slot, and isn't delivered with any controllers nor TV switch box. The whole system is made of the daisywheel printer, the memory unit and the keyboard. The power supply is built-in the printer! 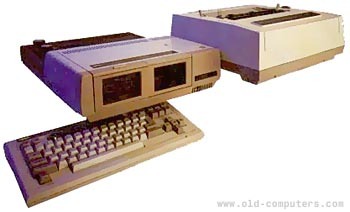 The Smart Basic isn't in ROM and has to be loaded from a tape, however there's a little word processor in ROM, this word processor prints the text to the printer at the same time the user types on the keyboard, but can also be used as a classic wordprocessor. The Adam had a pretty short life, only two years! Despite this there is still a community of Adam fans who still use their system. Nowadays, most Adam users use a 320k 5 1/4 inch disk drive, an external 2400 baud modem, and a 20, 30 or 40 megabyte IDE harddisk. Adams often have memory expanders up to 2 MB in size (which is usually used as a RAM disk), and also a parallel printer (like a bubble jet)! Greg Bowman reports that he got an external CD drive for his Adam from his uncle who was then Vice President of Coleco. He notices that this CD drive was designed especially for the Adam. If anyone has more information about this CD drive, don't hesitate to mail us. POWER SUPPLY Built-in the printer ! see more Coleco ADAM Ebay auctions !